No matter what industry you work in, chances are you have periods when you have less to do. For a lot of us, those quieter times occur routinely over the summer and at Christmas. These are typically the periods when many businesses are focused on covering staff holidays in the short term rather than embarking on longer term goals such as beginning new projects or making contact with potential suppliers. As a result, businesses across all sectors experience a quiet spell. It’s common to panic at this point: having spare time is an uncomfortable feeling when you know how closely it relates to your bottom line. There’s a temptation to chase after short-term work just to keep busy, regardless of whether it fits your long-term aims. But there’s a much better way you could continue to be productive during those quieter weeks. More often than not, our time is taken up with work in the top left of the board – it is important and it is definitely urgent. Examples might include responding to clients’ needs or customer complaints, picking up new enquiries, giving instructions to your team or sorting out broken equipment. If you don’t complete them, there will be swift consequences: more complaints, a loss of business or unproductive time for your team. Our natural instinct is to focus most of our time on this side of the square. The sense of urgency skews our perception of what is important and our workflow ends up being crisis-led: we’re constantly firefighting, rather than working strategically. Often, when things are quieter, the urgent side of the square is taking up less of our time. 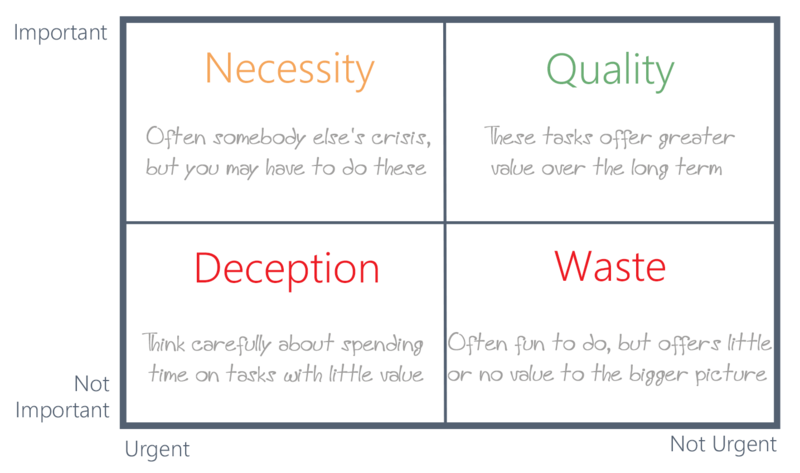 Our first instinct is to turn to the bottom-right square: the non-urgent and unimportant tasks. Browsing the internet, wondering if you should get a new laptop bag or reading a magazine could all fall into this area. We don’t need to do them now, they’re not contributing to our productivity, but in those rare quiet periods it’s tempting to do something mindless and allow our brains to switch off. Instead, try turning your attention to the top right of the square: the important but non-urgent tasks. These are all the things which make a difference to productivity but for which there are no immediate consequences if they aren’t completed. For example, strategic thinking and planning are often in this square – along with things like going to the gym. They are important to the business, or to your ability to work well, but there is no direct impact if you don’t do them. As a result, they are often put to the bottom of the list. When the quiet times hit, your first task should be to create your own Urgent vs Important Matrix. Focus on the Important side of the square and use it to be productive in areas that you often overlook because urgency pulls your attention elsewhere. If you catch yourself saying, “I’d love to do that, but I never have time” – now is that time. Prioritise the tasks you never get around to but which might make a significant difference to your productivity during busier times. Using quiet spells to lay the foundations for a more efficient workflow or a tightly focused strategy will help you reap the rewards when the busier months return. As leaders and managers, we all sometimes fall into the trap of thinking we can’t take time away from work. We worry about what might happen in our absence and we look at our ever-growing to-do lists and decide it would be better just to keep at it. With other team members taking their own holidays, we often feel it’s down to us to provide consistency to the business by staying at work. Yet there are sound reasons why taking a summer break is not only good for you, but could actually lead to a productive breakthrough that will accelerate your projects and goals. Research into problem-solving and innovation has shown that we have our best ideas and breakthroughs when our brain is able to make connections between different things. Great ideas are not really ‘a-ha!’ moments; they are more like the collision of different contexts or worlds. Yet often, when we are trying to see the world differently we do it in the same old environment, surrounded by the same old things. This conditions and limits our thinking to the known; not the best place to make a break through. To get new ideas, take a break from your normal environment, go somewhere different to spark different thoughts and memories. The more different the location, the more chance the environment will help you see the world differently. We also know that our subconscious mind is at its most intuitive when our conscious mind is occupied by a task that is not too taxing. When we are doing something that requires focus, the subconscious focuses on supporting what we are doing. Conversely, when we are not really doing anything, then the subconscious mind is not allowed to wander, as our conscious thoughts become distracting as they wander. To create the best conditions to allow your subconscious to focus on breakthroughs, new ideas or problem solving, occupy your conscious mind in something engaging enough to keep it occupied, while not too demanding. This is why you have your best ideas in the shower, out on a run or diving the car! So, chilling in the pool, or spending some time playing on the beach with family or friends could be just what you need. There is a whole area of psychology that focuses on our relationship with nature. Open natural spaces, especially where there are lots of green and fractal shapes (think plants and trees) create a restorative environment, helping to restore us to our baseline levels. That sounds a bit technical, but basically the evidence indicates that being in these spaces allows us to reduce stress and recharge. Yet where do we spend most of our time? In man-made spaces, focused on neutral colour tones and straight lines. In a nutshell, if all you can do is get out of the office and go for a walk in the park, it will make the world seem better. If you can take a few days out to explore more of the natural world, even better. On top of this, positive emotions, such as happiness, joy, gratitude and even serenity, enable us to think more widely and see connections and new possibilities. By contrast, negative emotions act to focus our thinking on the problem at hand, limiting the scope of ideas available. This concept of positive emotions was developed by the psychologist Barbara Fredrickson in her ‘broaden and build’ theory which shows how positive emotions help us thrive. Continuing with the same old routine isn’t going to bring new, positive emotions into our lives. Staying at work day in, day out will just serve to keep us focused on the same old problems. Instead, getting away, doing something different that brings us positive emotions – whether that’s heading out onto the golf course or taking the kids for a day at the beach – will open up our minds to new opportunities. So if you are thinking that you don’t have time to take a break this summer, that you are too busy, or up to your neck in alligators, then it might be time to think again. Some time in a different environment, especially a natural, restorative space, that gives your subconscious the time it needs to process the challenges and goals you are facing is probably just what you need. In fact, you probably can’t afford not to go on holiday. If nothing else, it will make you smile, and that alone may be enough to create the breakthrough you need. Do you wonder why your team are not as productive as they should be? Here are five ways you could be running your business with the handbrake on! It may seem obvious, but for people to be productive, they need to have a clear understanding of what exactly is expected of them, what rules and boundaries they are supposed to operate within and what timelines exist. Test it: Ask your people to describe to you their goal. Are they specific; is there a calendar date? In the absence of clarity we are effectively saying we don’t care where we end up! Imagine telling your team we are heading north: exactly where will they end up? Just one degree out at the start can lead to being miles off where we thought we would be by the time we arrive north. People will add the greatest value when they connect to the guiding purpose. They will generously give discretionary effort when they connect with a higher purpose. Look at volunteers for good causes: they gladly give their time for free! Your purpose provides the sense check for every decision you make. Test: Ask your people to articulate their understanding of the organisational purpose. Consider: how well have you articulated your organisation’s ‘why’? In his book Good to Great, Jim Collins describes the value of a corporate purpose. Imagine recruiting your people with all your focus on the ‘what’. If, like many organisations, your strategy needs to change, the connection with the ‘what’ is lost and their commitment is now challenged. However, your purpose should never change and therefore a team recruited to connect with the ‘why’ will happily adapt to a change in strategy: they will see it as necessary to achieve the purpose. Being too prescriptive, restricting the space for your people to explore and decide ‘how’ they go about delivering their objectives will feel, for them, limiting and disengaging. This feeling will restrict productivity, and your people will only do what is asked and no more as they are not expected to think. Even in environments that are heavily process-driven to maximise consistency, reduce waste and optimise output, people can be allowed to solve problems or create space for them to work on other areas of the business. Test: Ask your people what frustrates them most about their work. Look for opportunities where you can involve your people in improving the business, create mini projects for them to get involved in and make an impact on the company. When set up in the right way, these can provide many benefits; engaged people, improve collaboration & teamwork and tangible business results. People will hold back or fail even to get started on their objectives when they lack confidence or feel others lack confidence in them. This sense, feeling or perception creates inertia and leads to a waste of time which could cause missed milestones and costly project delays. Test: Ask your people on a scale of 1-10 (10 is high) how confident they feel that they can achieve their goals. Look for a 6 or above. A lack of confidence (a number of 5 or less) stems from ‘unhelpful thoughts’. These thoughts are based on assumptions, limiting beliefs and biases. They may not be founded in fact or reality yet we allow them to have debilitating effects on our performance. Externalising these thoughts is a crucial step to removing the interference they cause. This will require you to create an environment where people feel able to share concerns without feeling insecure or threatened. Test: Ask your people, if they had a magic wand, what three things would they wish for to make it easier to achieve their objectives. – Internal conflicts – a common cause of conflict is a lack of strategic clarity and purpose. It is this high-level perspective that enables priorities to be established and decisions to be validated. In the event of conflict, who wins out currently? Whose ego dominates? – Do your systems enable your people to do their job or do they perform in spite of them? Designing your systems around your people AND processes will enable them to be more productive. How many workarounds exist in your business? Have your people accepted and normalised these productivity killers? – Do the processes that you have spent time and money developing really exist and get followed, or are your people finding other ways to get the job done? Have your processes been over-engineered to meet overzealous interpretations of rules and regulations? The environment question provides an excellent source of potential value. Your people will happily tell you what’s wrong if given the opportunity – however, this comes with a health warning! Once you ask, you will raise expectations that things will change and whatever you choose to do with the feedback, above all, you must maintain an open dialogue about your decisions and the reasons behind them. Thinking Focus works with teams and business units in organisations around the world, helping them achieve breakthroughs by enabling them to think differently. Our clients range from medium-sized enterprises to divisions of blue chip multi-nationals. Working with teams on a specific issue, or across a business unit to drive productivity, we tailor the approach to deliver the desired outcome. We challenge teams to deliver accelerated behavioural change and performance improvements. One of the greatest challenges that leaders face in the workplace is how to motivate their employees. How best do we inspire and support them to increase their performance? There are many theories around employee motivation, but in the this blog we’ll be giving practical suggestions that all leaders can put in place immediately. Team Member: What Motivates Them? What Demotivates Them? The challenge is for leaders to see how many individuals in their team they could honestly complete this table for. Our guess is that many would find it a struggle! High quality leaders know these basics and use this knowledge to actively motivate their people, avoiding doing the things that they know cause demotivation. Let’s now turn our attention to three sources of thought which we think are important in employee motivation, engagement and performance. It makes sense for us to use this commonly-cited source as our starting point. Created by pollsters Gallup, it measures employee engagement and its impact on business outcomes by asking employees to complete a survey. The survey questions cover 12 areas of consideration, which we cannot directly quote because they are under copyright. However, the questions look at areas such as expectations at work; rewards and recognition; opportunities and progression; relationships between colleagues; materials and resources; leadership and support; communication; belonging, purpose and mission; and quality of work. Asking questions around these areas are really important and give us a great insight in to some of the motivating factors of all employees (ourselves included). But leaders then need to do something with the information they get from asking such questions. What could I do to ensure that all my people clearly understand what is expected of them? How could I make praise & recognition a daily habit for my team? What could I do to ensure everyone is constantly involved with driving the business forward? What opportunities might I create for growth for my people? And then, of course, they need to be proactive in committing to actions based on their answers to increase employee engagement and guarantee performance. This is described in the research as “our desire to learn”. For us, this is an important factor in employee motivation. Leaders need to think about their people and the opportunities for learning that are available to them. From our work with organisations, we recognise that many people are given (or forced in to) ‘opportunities’ through training programmes. But, how focused is this development in terms of both what they really need to be a high performer and what they really want for their own development? As a leader, ask yourself: How could you ensure that the desire to learn is (appropriately) fulfilled in your people? This is highlighted as “our desire to make our own decisions” and, in our experience, it’s something that many employees may feel divorced from. Leaders need to consider what opportunities exist for their team members to make decisions. It’s not necessarily always about what they do (these will, after all, reflect your team or company goals), but certainly about how they can achieve them. Many managers will highlight what they need people to achieve, which does give focus. But they will also insist on the way in which things must be achieved, and this can stifle creativity, limit continuous improvement and ultimately demotivate. High quality leaders understand that the ‘What’ may need to be told, but the ‘How’ should be within the gift of the employee to decide. As a leader, ask yourself: What freedom could you give your people to enable them to decide how to achieve your team goals? This is described as “our desire to behave in accordance with our code of conduct”. More simply put, it’s about ensuring that our values are met in whatever we do. Many people are demotivated by what they see as a lack of congruence between their personal values and how the company they work in is operating. One a leader’s roles is to understand the values of their people and help them to align these values with where their organisation is headed. As a leader, ask yourself: What could you do to ensure there is ‘values alignment’ for your people? Quite simply, this is “our desire to influence people”. It’s one of the more curious Human Motivational Factors, but it’s something that can be seen every day in the workplace as people strive to gain the buy-in of others for mutual success. Something that many of us desire is order – in other words, we crave the certainty and organisation that daily routine and habits give us. We all have things that we do in a certain order, and most of us strive to be much more organised and structured. The number of people we’ve helped with their time and personal management demonstrates how important order is to us. We’re big fans of giving supporting structures and certainties to people, as long as they work, bring about success and allow for individual involvement. As a leader, ask yourself: What structures or order might your people need, and how could you ensure these are put in place to support your team? We believe strongly that inspiration can come from many areas, and the story of Ron Clark shows us that, no matter what your walk of life, when you’re looking to develop the motivation to perform, there are some simple things you can do. Ron was a teacher in in a tough New York school when he won his award in 2000. He went on to become a New York Times bestselling author and a motivational speaker on the subject of inspiring educators. We’ve picked out three of the areas he highlights when talking about motivation in the classroom, which we think continue to be very relevant in the workplace. Setting stretching, yet achievable, targets works! People will generally perform to the level that’s expected of them. If we expect little of people, they will match our expectations. The flipside that we, as leaders, can embrace is expecting great things from our employees – and giving them the skills, tools and resources to enable them to meet our raised expectations. As a leader, ask yourself: What expectations could you set that might challenge and stimulate your team? It seems really easy – and really commonplace – for the negative stuff such as lack of achievements to be brought to the fore. But building in celebration and praise are essential tools in developing employee performance and maintaining motivation. As a leader, ask yourself: What might you find today that you could praise and celebrate? We recognise that there is value in having an interest in your people – and, as Ron suggests, this should be a genuine interest. At the simplest level, this is being interested in the response to questions; really wanting to know the answer to “How are you today?”. As a leader, ask yourself: How could you develop a genuine interest in your team, and how could you show that you really are interested in your people? As leaders, there is no magic wand we can wave to increase employee engagement and performance. However, one thing we can do is to invest quality time in understanding what makes our people tick. This forms the very basis of any aspect of managing people, and is the building blocks of high performing teams. We recommend taking time to invest in your people and find out what really motivates them. After all, they really are the best asset your organisation has. A range of organisations are turning to gamified learning as a way of motivating employees, boosting engagement and driving business success. The technique allows companies to deliver effective learning content and training strategies combined with an element of fun. Applied successfully, it can help businesses achieve goals and outcomes by using game dynamics to connect with employees, gain feedback and measure performance. ‘Gamification’ is the use of game thinking and game mechanics in a non-game context to engage users and/or solve problems. It uses achievement, reward, creativity and self-expression and then uses points, badges, levels, leader boards and various challenges to motivate employees. But these mechanisms don’t always make a difference on their own. The focus of the approach needs to centre on individual development – the ‘human aspect’ – to help employees feel valued and enhance their problem-solving skills. Many companies apply gamification within their apps, websites or e-learning tools but the good ‘old fashioned’ board game can have equally positive benefits, as well as some extra ones. A key difference is that they bring people together to play and discuss the game face-to-face. This leads to a greater sense of engagement and a more productive session. When it comes to the way we behave in different scenarios, board games can develop areas such as communication, resolving conflict, team work, creativity negotiation, empathy and decision-making. They can help to increase learning and create a sense of achievement. As an example of how even ordinary board games can teach us business skills, take Amazon’s best-selling board games in 2017. They include the classic Monopoly, which teaches us how to seal a deal and use negotiating skills as each player looks to build up their position on the board. And the fast-talking description game Articulate is not only a lot of fun but also tests skills of creativity, communication and team-work as players work together to achieve a common goal – with the added, high-pressure element of having just 30 seconds in which to describe as many words as possible. So think how effective a board game would be that’s specifically created to be played in a business environment, and focuses on work-based scenarios. This was our thought process when one of our clients, world-leading car seat manufacturer Adient, asked us to help find an innovative solution to their management training needs. The result was that we created a gamified learning solution based on a traditional board game, using a simple game play premise to improve leadership skills, engagement, and communication between peers. What Would You Do? is a scenario-based game which tests decision-making abilities both in an immediately reactive as well as a more considered way. Although points are awarded for preferred answers, enabling participants to move up the board and win, the mechanics of the game are really just a vehicle for generating discussion and debate, and sharing experience and expertise. It allows peers to work through business issues in a fun and engaging way. What Would You Do? is available to all businesses and is aimed at first line managers, team leaders and supervisors. It also works as a resource to develop graduates and identify management potential. It was launched in May and received overwhelmingly positive feedback, with the board game approach proving particularly successful in engaging participants and helping to make learning stick. Why do change leaders focus on the plan rather than the people? It is not uncommon to find elaborate, well-thought-through change plans missing just one ‘small’ component: the people. Why does this happen? Why do some change leaders get so lost in the detail of their planning that they forget to bring the people involved along with them on the journey? Paul and Richard discuss why it can feel easier just to focus on the plan – and what happens when people get left out of it. Effecting change involves two things: there’s the practical side of it and then there’s the ‘transition’ of taking people through it. Focusing on both elements leads to successful change. Having an awesome plan without the engagement and support of your people will mean it won’t be as effective as it could be. A change plan can take up a lot of time and effort but, in a way, it’s the easy bit. Most change leaders have technical or project management skills, and know how to create a strong plan. It’s an area they feel comfortable with. But when it comes to taking people through the transition, the process is more unpredictable. So, if you’re leading change and have a great plan but haven’t really looked at the people side, where do you start? We’d suggest taking a step back and assessing where people are on the change journey. Ask two questions: 1, What is their attitude to this specific change? 2, How much energy are they putting into this? The likelihood is that at least half of the people will be Spectators. They are in the neutral zone, supportive of the change but with low energy. However, the great thing is that they can become engaged with the process if they are given information and choices. The Champions are the people who are supportive of the change and are putting a lot of energy in to it. They can help the leaders by taking some of the burden and acting as positive role models for the Spectators. The ‘Corporate Corpses’ are the zombie brigade – people who have very low energy and a very bad attitude, although they’re not being disruptive or causing any trouble. The Saboteurs are usually the very noisy vocal minority who have a bad attitude and lots of energy. They are the people who are trying to hold back change and undermine leaders. They tend to attract attention and effort which should instead be focused on trying to engage the Spectators. When we ask organisations about the challenges they face, one recurring theme is trust – how organisations gain, and can easily lose, the trust of their people, and from a leadership perspective, the importance of developing trust. Trust has been seen as important as far back as Aristotle, who noted that trust (or ethos as he called it) was built upon three perceived factors: intelligence, character and goodwill. These factors were also commented on in a dissertation by Dr Duane Tway (A Construct of Trust – 1993) who similarly suggested that trust was a construct of three parts: the capacity for trusting, the perception of competence and the perception of intentions. What makes trust important in running a 21st century business? If you, like many of the HR community we collaborate with, have wondered whether trust is alive and well in your organisation, first of all take a step back and consider how important a role trust should be playing. As an example, let’s look at the current UK climate of trust with regards our own country’s’ leaders – the politicians. Like leaders anywhere, this group of people should be role models for ‘the way we do things around here’, but in the back of many people’s minds there has always been a question of how much these leaders are there for their people, or how much they are in it for themselves. ‘Catching them in’ and spotting when they are fulfilling their leadership potential often goes unnoticed, but ‘catching them out’ is quickly picked up, reported and commented on. And in one fell swoop trust gets damaged, role models are lost and leadership is no longer respected. How many times does this happen in organisations? If trust is so easy to damage, what makes it important for us in running modern businesses? We believe, as have many others before us, that trust is the bedrock for any organisation structure. It’s part of what makes your business what it is and forms the basis for organisational culture. How can we build trust? Intelligence: In today’s organisations we can translate intelligence for knowledge and skills – how skilled are your supervisors, managers and leaders? And possibly more importantly, how is their skill perceived by their people? This aspect of trust is the easiest to develop, and for us is part of strengthening your teams. What might a skills audit of your leaders highlight as development needs, which could be impacting on how people trust them? Character: Reliability and honesty are key components here. Recruitment interviews, references and ongoing performance reviews ascertain the character of the people leading our organisations, but the true test of reliability and honesty will come from an ‘all staff’ approach. When was the last time you fully reviewed your leaders adopting a 360 degree approach – and if you haven’t so far, what could be the benefits of doing this? Goodwill: The intentions of leaders, as perceived by their people. Unfortunately there’s no easy approach for this – goodwill develops over time, but if intelligence and character are supportive of trust, goodwill will follow. How do leaders develop, and maintain, goodwill in your organisation? More recently, the arena of trust seems to have been dominated by Stephen M R Covey and his book, The Speed of Trust. A valuable addition to any library, this book clearly highlights ‘five waves of trust’ and thirteen ‘trust behaviours’. What can we learn from ‘The Speed of Trust’? Many of the above ideas are echoed in Covey’s work. He emphasises the importance of trust as an aspect of leadership (even going so far as to say inspiring trust is the ‘number one job of any leader’) and suggests that trust is part competence and part character. Building on this is the suggestion that trust affects the speed of activity and cost within an organisation: where trust is prevalent speed goes up and cost goes down (and vice versa) and that when trust is built between individuals, it builds across a team/department/organisation. Self-trust – with the underlying principle of credibility. This can be developed through personal integrity, intent, capabilities and results. Relationship-trust – with thirteen underlying behaviours covering how we speak honestly, demonstrate respect, create transparency, right any wrongs, show loyalty, deliver results, continuously improve, confront reality, clarify expectations, practise accountability, listen before speaking, keep to our commitments and extend trust to others who have earned it and are still earning it. Organisational-trust – that is aligned trust inside your organisation, This is part of your company culture and Covey believes it is established through systems and structures which support the culture you want to have. Market-trust – trust generated by reputation. We all know the importance of our external reputation and how this affects our overall performance, but the implication here is that the way we treat external contacts, whether customers or suppliers, is vital. Societal-trust – trust generated by contribution, often referred to as corporate social responsibility. Rather than a box-ticking exercise of having a charity of the year or doing a day’s work in a community garden, this is about making a genuine positive contribution to your community in the long term. 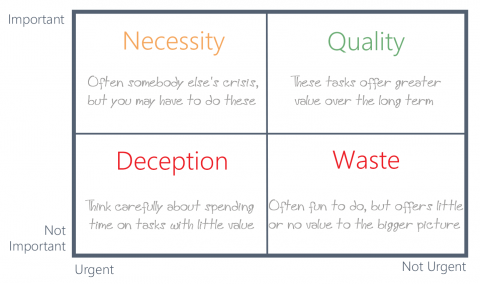 What loses trust – and how do we restore it? Internally – miscommunication, withholding information, acting against agreed values, mis-handling change, being self-serving and ‘looking after number one’. Externally – poor service, not doing what you say you will do, squeezing suppliers in times when record profits are being made and damaging local communities and/or the environment. However, even lost trust can be regained if we act quickly to restore that which we have lost, exceed expectations in correcting our mistakes, be honest about why things have gone wrong and not only repair the damage now, but ensure it will never happen again and accept full responsibility. In our working lives, most of us have come across someone who seems to be able to lead people easily. Others want to follow them, and even when they don’t, the leader seems able to negotiate an effective agreement without too much trouble. It is worth noting from the outset that true negotiation or influencing is not about manipulation. If manipulation is unethical and, potentially, bullying people into doing the things we want them to, negotiation and influencing is helping people get to the same place as us through motivating them to action, engaging their emotions and ensuring a real ‘win-win’ is achieved. Understanding the basics of negotiation is essential for any leader. Whatever stage you’re at as a leader, the following process will help you in any situation where you find negotiation being key. Understanding ‘what’: The basis of this stage is clear objectives: answering the questions “what do I want from this?” and “what do I have to get to meet my needs?” could reveal two separate objectives, but the leader understands why both are important. To ensure the ‘win-win agreement’ is reached, the same level of clarity is needed on both sides. Let’s disagree: Disagreement is a present in nearly all negotiations, and at this stage the role is likely to complete the switch from negotiator to influential leader. Preferences for dealing with conflict will come into play and at this stage the move from ‘wants’ to ‘needs’ is most likely to take place. If it no longer looks like what is wanted is achievable, the answer to “what do I now need to get from this negotiation?” becomes the prime concern. Getting the win-win agreement: This is the reason for the negotiation – the stage where both parties get what they want, or at least part of it. Having reached this stage, the most obvious answer is “what do we do now?” and from, this formal arrangements and agreements are created. Much has been written about powers of persuasion and influencing, more often than not in the context of selling. However, all leaders need to be able to develop themselves in this way – a requirement commonly missed if you’re not a ‘sales leader’. For instance, shaping the organisational structure and getting the buy-in of others, helping others to understand their role and how it supports your vision, getting support for innovative leaps – each and every one an opportunity to make the most of your influencing skill. One of the greatest texts we’ve come across for understanding how influencing works is ‘Influence – Science and Practice’ by Robert Cialdini, and this research backed book highlights six clear influencing strategies that anyone can develop – and we’ve all seen them in action on a daily basis. Here are six simple thoughts on how to develop yourself as an influential leader. Liking: does what it says on the tin! This is all about people buying people. Think about those around you who do things for people just because they were asked by someone they like and ask yourself “what are my most likeable qualities?” or “how do I develop more likeable qualities?” We all have them; sometimes it helps to make sure we keep working at them! Authority: there are times when we all accept the words of others simply because they are giving us information from their specialist field. The influential leader understands this and knows the expertise they can trade on. This is not simply telling someone to do something because you’re the boss; it’s explaining something that you have a greater understanding of because of your background and training. So consider “what gives me authority?” and make the most of this where appropriate. Scarcity: We see this one all the time: ‘Sale must end Monday’, ‘Last few available’. Whenever something appears to be limited, the scarcity principle kicks in. The influential leader knows this, understands the scarce resource that they bring with them and makes sure this principle is applied where necessary – because people want that ‘limited offer’. Understand “what do I have that is a rare commodity?” and think about how this could help your influencing style. By following the negotiation process above, and developing your powers of persuasion you will be well on your way to becoming an influential leader – and to ensuring that win-win is around every corner.